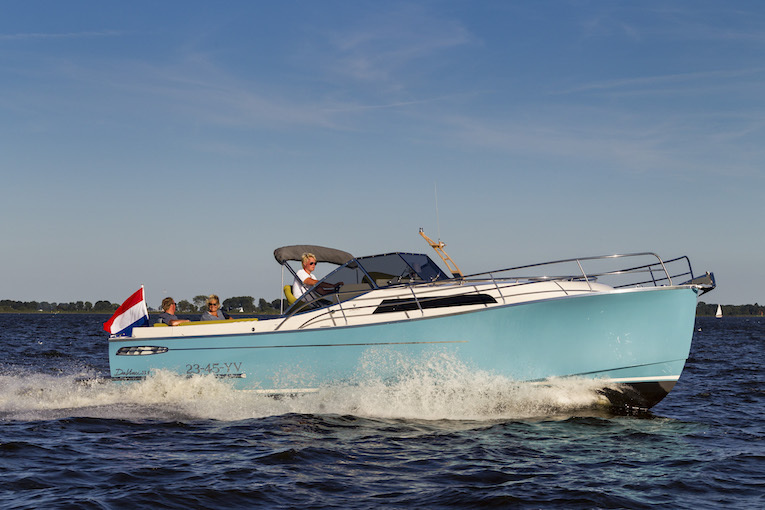 The Dutch yard Da Vinci Yachts has been building striking semi-classic vessels since 2001. Recently acquired by another company, the yard in Heeg is taking things to the next level with a facelift for Da Vinci's boats and specific changes to their size and degree of comfort. 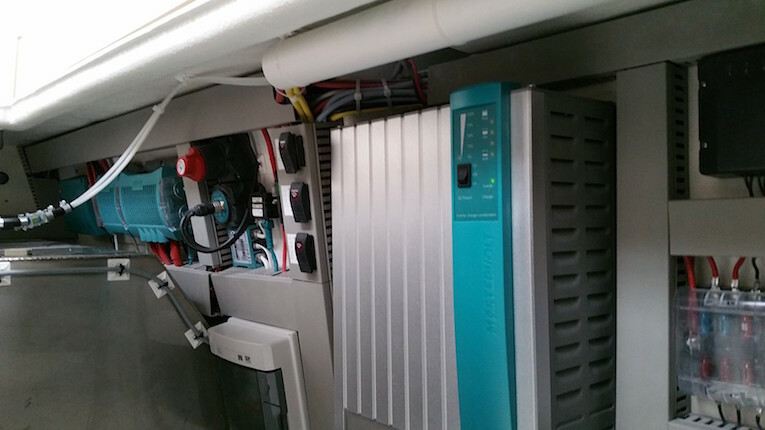 Da Vinci Yachts has, moreover, chosen to equip its vessels with a Mastervolt and CZone system in the future in a clear response to customer wishes and changing market conditions. A major attraction of the Mastervolt and CZone system is that it enables you to program various operations in advance. This allows a series of activities to be activated or turned off with a simple touch of the screen. Boat owners therefore have an intelligent system that they can adapt entirely to their own use and needs. The global service that Mastervolt provides was another deciding factor for the Dutch yacht builder. The latest Da Vinci model was recently nominated for the HISWA Motorboat of the Year 2017 award. This gave the company an extra lift and Erik van Veen, general director of Da Vinci Yachts, sees it as confirmation that he has made the right choices. The AC and DC consumption of this vessel require a battery capacity of 5.5 kWh for one day of autonomous operation without recharging. 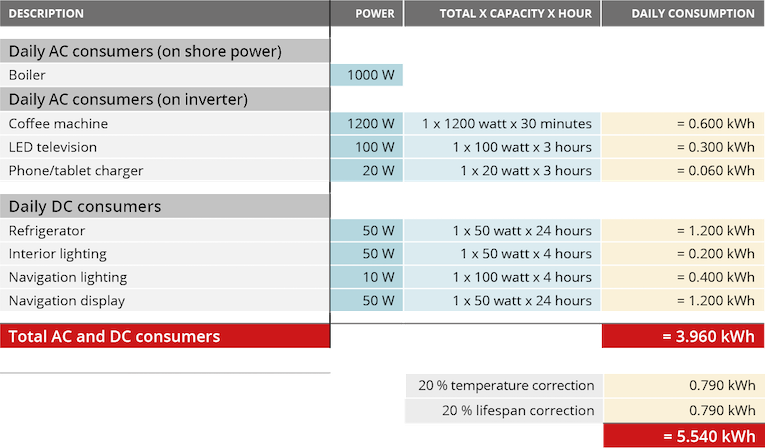 This corresponds to a battery capacity of 450 Ah (2x 12/225 Ah in parallel). As the construction of AGM batteries allows them to be very quickly discharged, they are highly suited to systems which require high currents (such as starter engines). These batteries are completely maintenance-free and produce no gas in normal use. As there is no need for extraction, they can be fitted anywhere. AGM batteries can be charged with up to 25% of the installed battery capacity. The Mass Combi 12/2200-100 includes a 100 A battery charger which is very well suited to the efficient and safe charging of this AGM battery bank. In addition to a battery charger, the Combi also includes an inverter with a power of 2200 W, all in a single casing. This high capacity ensures a carefree energy supply on board. 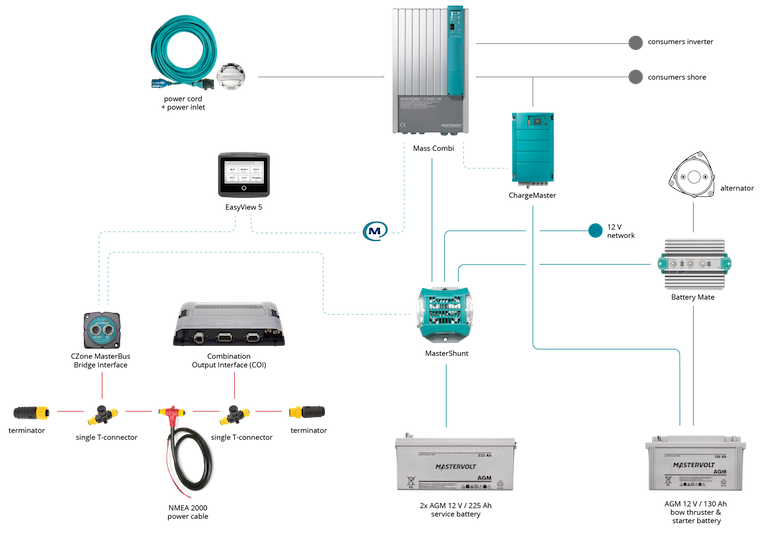 CZone digital control and monitoring (in combination with a MasterBus network) simplifies the installation of electrical systems. This network replaces complex wiring and control panels with clever and robust interfaces and an NMEA 2000 network cable. Additionally, CZone provides advanced solutions to complex control and monitoring issues affecting the modern systems on vessels. 1 x Power cable 16 A - 25 metre 2,5 mm². 1 x Stainless steel inlet, 2+PE, 16 A/230 V.
1 x ChargeMaster 12/25-3, extra battery charger for the bowthruster and starter battery. 1 x EasyView 5; touchscreen control panel. 1 x MasterShunt 500; MasterBus-integrated battery monitor with detailed information about the status of your battery. 1 x Battery Mate 1602 IG; the ultimate solution for simultaneously charging multiple batteries. 1 x Combination Output Interface (COI). 1 x CZone MasterBus Bridge Interface.